This Friday, June 6, marks the 70th anniversary of D-Day, the Allied landings at Normandy, involving the largest invasion force ever amassed. The overall contours of the Normandy invasion are pretty well-known at this point: the 150,000-plus Allied forces involved, the thousands killed or injured in an enormous assault that led to the eventual liberation of Western Europe and the collapse of the Third Reich. This was the epic military event of the century. What’s harder for most of us to keep sight of is this: Every single one of those numbers—each of the Allied forces, each of the German soldiers, and each of the French civilians who were killed or liberated in the subsequent days—represents an individual person’s story of war experience—and, by extension, the experience of family members. 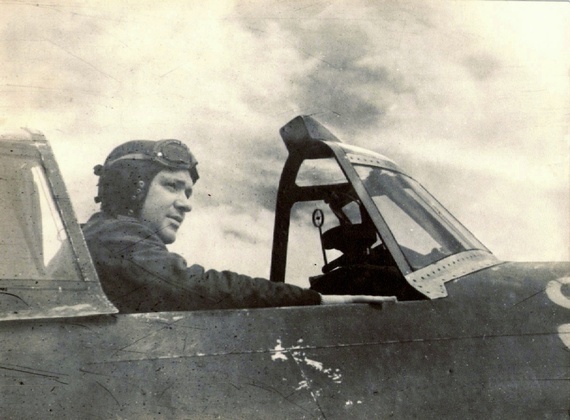 I got to thinking about this recently when, clearing things from my attic, I came across a box of items belonging to my late father, Thomas M. Tierney, who, in his twenties, was a fighter pilot in World War II. He served in the European theater, in a fighter squadron that was active in the lead-up to D-Day, during the invasion itself, and in the months following. I hauled the box down to the dining room and disgorged its contents onto the table there. While I was vaguely familiar with some of the material in it, I had never studied it closely. When I did so, it was a revelation—and provided, for me, a much more personal, even intimate, portrait of the war and those who lived it. Dad’s “Flight Record And Log Book” tells stories he never divulged to us. It contains the day-by-day record of his combat missions and sorties. The details in the book—and the additional research they’ve prompted from me—have fleshed out his war experience and cast new light on the intersection of that experience with his marriage and thus, on our family history. I find some of it quite moving. My dad was 22 and finishing law school at the University of Denver when Japan attacked Pearl Harbor and the U.S entered the war. He immediately applied for air-cadet training and, by February of 1942, he was at an Army Air Corps flight school in Tulsa, Oklahoma. Then on to Enid, Oklahoma and San Antonio, Texas. By September, he had completed his cadet training and was commissioned as an officer stationed at Key Field in Meridian, Mississippi, where he started instructing other pilots on, by my count, at least five different kinds of planes. He was there until the end of 1943, when his fighter squadron prepared to head to England for combat duty. My parents were married in late April, 1943, when my dad managed to get a brief leave to return to Denver, where my mother, Betty Fairall, was living, and where they both had grown up. From their wedding until the end of that year, my mother lived with my dad in officers’ barracks at Key Field. She then returned to her family’s home in Denver, because in early 1944, my dad’s squadron—the 492nd Fighter Squadron (part of the 48th Fighter-Bomber Group)—ended its two years of intensive flight training, left Key Field, and went to the East Coast. The group spent three months in South Carolina, conducting coastal patrol missions, and training in the fearsome P-47 Thunderbolt, the plane that they would use in combat. When my dad learned that his fighter squadron would be sent to England for combat duty in March of 1944, my mother traveled from Denver to the East Coast to bid him farewell. My three older brothers and I have long known the basics of what happened next, but I, at least, was unaware of the timing, the juxtaposition of dates, and what it all must have been like for my parents. On her return trip to Denver, my mother took a train to Omaha, Nebraska. Her father, Herbert C. Fairall (in photo, at left), a prominent newspaper publisher and businessman in Denver, drove to Omaha to pick her up and take her the rest of the way home, thinking the drive would give them quality time to spend together. In Ogallala, Nebraska, driving in the midst of a snowstorm, my mother and her dad had a horrific automobile accident on state route 30 (now I-80), colliding with a bus. He was killed instantly. My mother (photo below, right) suffered severe leg injuries (multiple compound fractures of her right leg) and was hospitalized for more than a week in Nebraska before she could return home to Denver for more care. What I had not known, until I pieced together all the details I gleaned from the materials in the dusty box, was that this trip of my mother’s was to see my father before he embarked to Europe. (I had thought it was just a visit to see him at his training base in Mississippi.) The automobile accident was on March 21, 1944. By that date, my dad’s squadron was halfway to England aboard the RMS Queen Mary, having left New York on March 13, not to arrive until the 28th in Gourock, Scotland. So, as Mom lay in a hospital bed in Ogallala, she was dealing with her father’s tragic death and the knowledge that her husband would soon see combat. And as Dad arrived in Europe to prepare for combat, he was finding out that his bride of 11 months was in a rural Nebraska hospital, suffering from severe injuries, and that his father-in-law had been killed as part of the effort to bring the two of them together before my dad’s departure for Europe. Almost immediately after their arrival, the squadron began a rigorous training program, flying dive-bombing, glide bombing, night flying, low-level navigation, smoke laying, reconnaissance, and patrol convoy sorties. Over the next two months, the number of sorties steadily increased and the squadron flew its first combat mission on 20 April 1944—an uneventful fighter sweep of the occupied French coast. Assisted the Normandy invasion by dropping bombs on bridges and gun positions, attacking rail lines and trains, and providing visual reconnaissance reports. Moved to France in mid-June 1944, supporting ground operations of Allied forces moving east across northern France throughout the war: primarily providing support for the United States First Army. Eventually was stationed in Occupied Germany on V-E Day. That summary syncs with my dad’s own flight record. Here are a few pages from it, with his notes about heavy flak, dive-bombing, strafing trains, etc. The time notations to the right of the dates refer not to time of day but to the duration of each flight. As someone unfamiliar with combat, I find it difficult to imagine what it must be like to end a day by cataloging the horrors that have befallen one’s mates. But having seen this detailed record of his experiences in combat flight, it’s now easier for me to understand why our dad didn’t want to discuss the war. Some veterans talk a lot about their war experiences; some don’t. Dad didn’t. At most, he told stories about flying over Key Field in Mississippi and, like the other pilots, tipping the wings of his plane in salute to his new wife on the ground below. “I made my run at a train , avoiding flak from disguised boxcars,” Captain Tierney said after the raid. “The engine disintegrated in smoke and steam as I came in at about 10 feet above the ground. About 100 fighter-bombers poured shells and bombs into Nazi trenches just a few hundred yards ahead of the advancing Yanks. Officials said it was the greatest close air support mission ever aimed at a single target. Capt. Tierney led the first squadron of planes in a dive from 6,500 feet to skim over the Nazi troops and drop lethal charges into their midst, opening the way for the ground fighters to advance. Ultraprecise bombing was necessary to prevent casualties to the Americans, separated from the Nazis by only a narrow no-man’s-land. My dad apparently was a very good fighter pilot and was highly decorated for his service, earning the Distinguished Flying Cross, the Air Medal with 13 oak-leaf clusters, and the French Croix-de-Guerre. He also was awarded a Purple Heart (I think, for that clipped-wing incident). He held the rank of major when he was discharged from the service in December 1945. Dad came through the war years relatively unscathed (though we can never know what he regularly relived in his mind). Most people who knew him would surely have described him as a happy man. My mother wasn’t as fortunate. The automobile accident that killed her father was followed in swift order by the combat death of her beloved cousin in Italy and then the near-fatal injury of her only brother during the Battle of Saipan. For the rest of her life, she suffered from serious depression and severe anxiety. No wonder. Yes, I’m aware that this story is not unusual. Hundreds of thousands experienced horrors during World War II. All wars have significant effects on combatants and their families. And many of those stories are, unfortunately, much more harrowing than the one I’ve told here. I write this merely to provide some individual faces and texture to the coverage of the D-Day anniversary—and to honor my dad’s contributions in the war and those of all the other brave and heroic people who served, especially those who lost their lives or suffered life-changing injuries. This is what anniversaries are good for. They’re occasions to remember and reflect. Categories: Family | Tags: family, fathers, fighter pilots, World War II | Permalink.